We sotte' the hot pepper and the garlic until they get nicely colored. 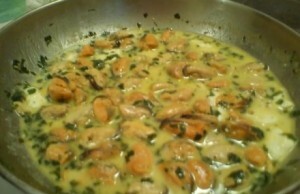 We add the white wine and after it boils we add the mussels. If the mussels are fresh without shell we add a little water from the packing, otherwise we add some water from the faucet. We add the mustard. We let the mussels boil for about 5-7 minutes not more than that. As soon as the mussels are ready we add the feta cheese cut into small cubes. At last we add the flour to the sauce and we steer.